Every summer during college, about half of the football team would stay on campus to work out together and find a summer gig in the Boston area. Our combined cooking ability was limited... lots of over or underdone ziti and grilled chicken. 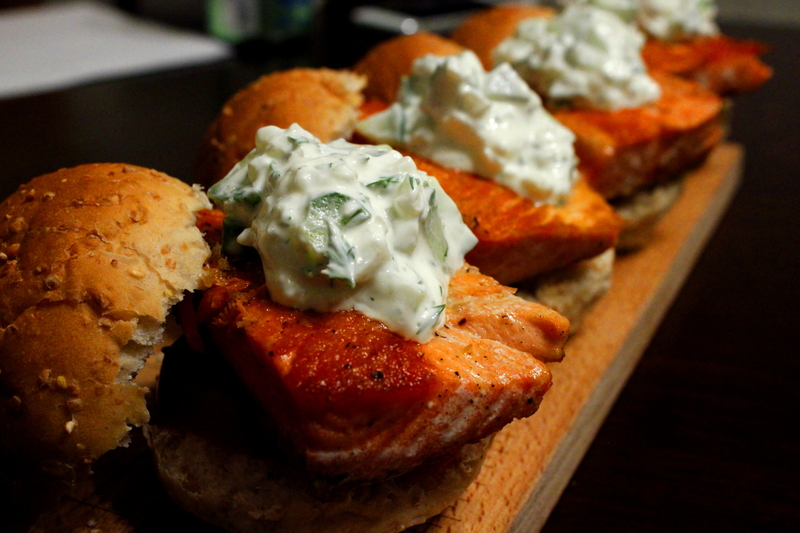 One weekend, a teammate's girlfriend was visiting and spoiled us with Salmon with Cucumber Dill Sauce. Playing fullback at Harvard led to a lot of self-induced headshots. My 12-time-concussed brain decided that the recipe for the cucumber dill sauce prepared that summer was a memory worth storing. With a couple of tweaks it made the perfect condiment for these sliders. 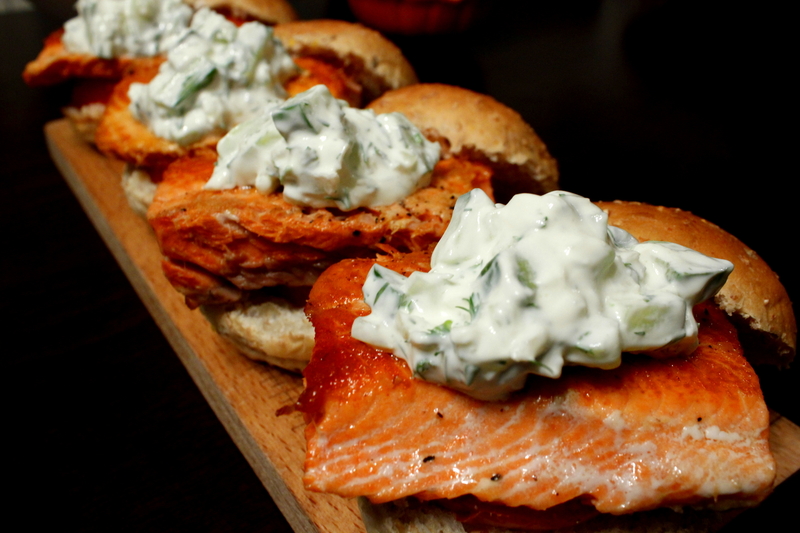 Salmon sliders with cucumber dill sauce and tomato. 2. Mix all sauce ingredients. Taste and add additional salt and lime juice if necessary. 3. Heat 1 T of Olive Oil on medium-high in an oven safe skillet. 4. Brush top side of salmon with remaining oil and season with salt and pepper. 5. Brown salmon (oiled side up) for 4 minutes or until crisp crust forms. 6. Flip and brown the other side until the same level of crust is achieved. The oil you applied earlier will help this side not to stick. 7. Place pan in oven and allow to cook through, about 8 minutes. 8. Remove from oven, allow to rest for a couple of minutes, and cut into four even pieces. 9. Brown slider buns if desired. 10. Layer tomato slice, then salmon, then a quarter of sauce on bottom bun, top and enjoy.